The fun isn't over though. 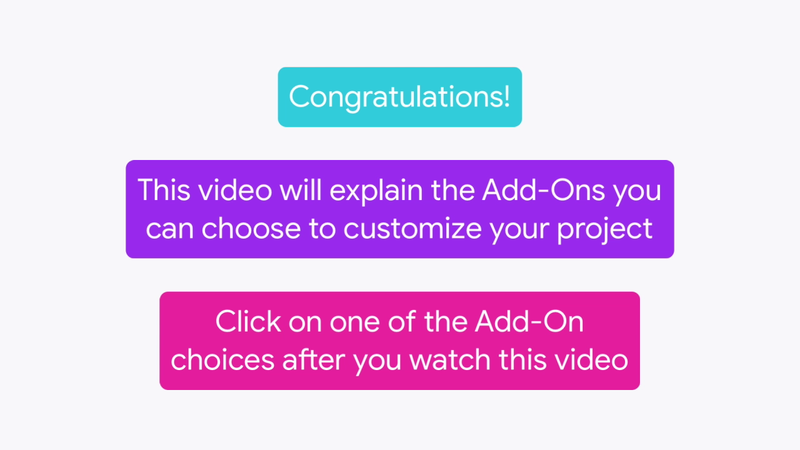 To get started, click on one of the add-on choices after you watch this video. Make your company name or message more memorable with a special effect in Cool Company. Add an element of gaming when your audience tries to click a moving sprite to redeem a reward in Catch a Break. And add a button for purchasing your product in Buy Button. Finally, ask you audience a question and program a response in Ask Your Audience. If you want to continue to create and explore after today's club is over, you can access Scratch and CS First from any computer that has access to the internet. Make your company name or message memorable with a special effect. Create a moving sprite for the audience to click on. Add a button for buying your product. Ask your audience a question, and program a response.